In most of the animated family films produced by American studios these days, magic tends to get sacrificed in favor of irony and pop culture references. If it's old fashioned timeless fantasy you crave in your cartoons, you have to look overseas to outfits like Japan's Studio Ghibli (SPIRITED AWAY, MY NEIGHBOR TORTORO). Now, it seems, one can also rely on the Irish studio Cartoon Saloon to scratch that itch. 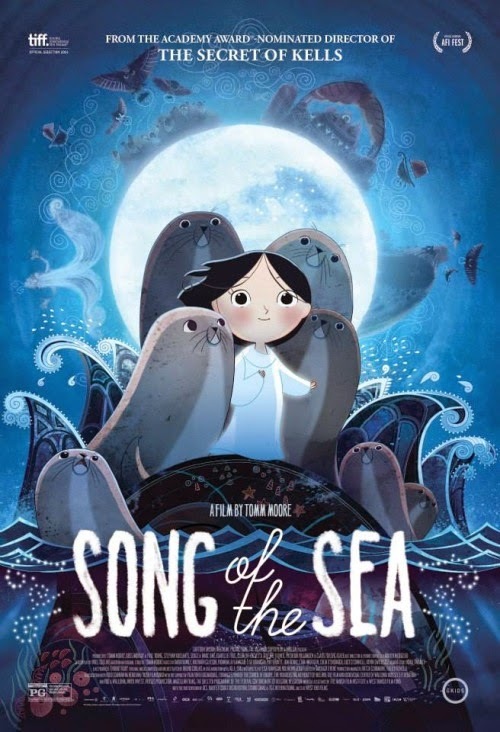 They've followed up their 2009 Oscar nominated THE SECRET OF KELLS with last year's (although just now appearing on these shores) exemplary feature SONG OF THE SEA, both directed and from stories by Tomm Moore. The plot concerns two young siblings, Ben (voiced by David Rawle) and his mute six year old sister Saoirse (Lucy O'Connell) sent by their lighthouse keeper father, Conor (Brendan Gleeson), to live with their uptight grandmother (Fionnula Flanagan) after Saoirse mysteriously wanders into the sea and nearly drowns one night. Highly dissatisfied with this turn of events, the kids set off to find their way home and wind up stumbling into an adventure filled with faerie folk, witches, and most importantly, selkies, a kind of Irish were-seal. Although set in the present day, the film makes few concessions to modernity. Even when they kids are in the big city, there's an aura of the supernatural in the air due to it being All Hallows Eve. Just about everyone they see is wearing some kind of costume, allowing the genuine supernatural entities to blend right in. The message of familial responsibility and acceptance is integrated organically into the narrative, and there's no snark or references to things that will almost certainly be dated, if not outright forgotten, in time. The animation is also refreshingly different from what we're used to either from Disney/Pixar and their imitators, or from the countless studios pumping out Japanese anime. It's not as slick as either of those approaches, and at times it seems deceptively simple. Then a scene will come along that suddenly reveals the full extent of its complexity and beauty. I'm still mad that THE LEGO MOVIE didn't make the cut to be nominated for Best Animated Feature in this year's Oscar, but having now seen SONG OF THE SEA, I can say at least the true best animated feature of the year did. 4 out of 4 stars. Family Guy explained it: "Japan! They kill things that we like!"